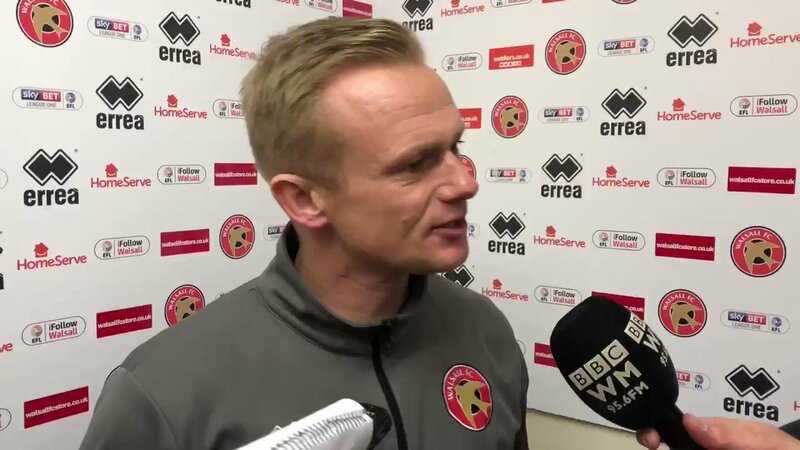 Dean Keates: "Probably The Worst Performance of the Last Four"
Walsall boss Dean Keates has spoken to the press following Saturday's League One defeat to Play-Off chasing Doncaster Rovers and admitted that he was frustrated as his side fell to a 3-1 defeat, after conceding two goals in just a couple of first-half minutes. Grant McCann’s Doncaster snatched a two-nil lead inside four minutes of the first-half – striker John Marquis converting a penalty after George Dobson was adjudged to have felled Mallik Wilks inside the box, Wilks would go on to grab his side's second just moments after the first. Summer signing Josh Gordon bundled home to halve the deficit after fourteen minutes, but Danny Andrew’s 39th-minute free-kick restored the hosts’ two-goal advantage before the break, a scoreline the Saddlers were unable to dent during the second forty-five. Despite a lack of second-half goals, Walsall were not without opportunities - Isaiah Osbourne hitting the bar with a close-range header and Zeli Ismail, Gordon and Corey Blackett-Taylor all drawing saves from goalkeeper Marko Marosi, but it was not to be as Donny secured three crucial points on the road to the Play-Offs. Keates, who was speaking to both Walsall and Doncaster-based press, rued Walsall’s wastefulness in the front of goal but was particularly disappointed with the nature of the second Rovers goal, he said; "I watched Doncaster the other night. You do your analysis on them, your homework on them – they do start bright and we knew about that. "Let’s not talk about the first one – the contact is a yard outside the box. It’s the second one – we have to be in check of our emotions. There’s 87 minutes left to go of the game, we have to make sure we keep ourselves in the game. At 1-0 down, you’re going to create opportunities. To go 2-0 down straight away was a bit naïve. "It’s something that needs addressing. Performance-wise, I thought today was probably the worst performance of the last four, but we still got into good areas. We should have gone in at half-time at 3-3. We had two chances – one cleared off the line when it had to be a goal, and the one that hit the crossbar had to be a goal. "Second half, we kept going. There was always the opportunity of leaving yourself open and a little bit vulnerable because you’re trying to force the game. We got into good areas. There were one or two good blocks. "The keeper’s pulled one or two good saves off from Corey Blackett-Taylor and Josh Gordon. We’ve got a six-game season. It’s still tight down there and we’re playing teams around us."